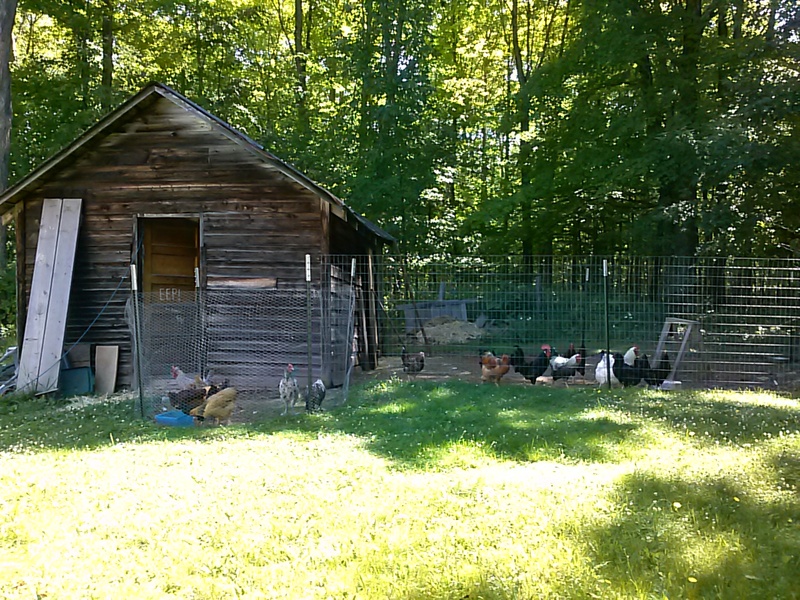 A view of our old chicken run – we had the babies in a chicken-wire fence away from the adults. 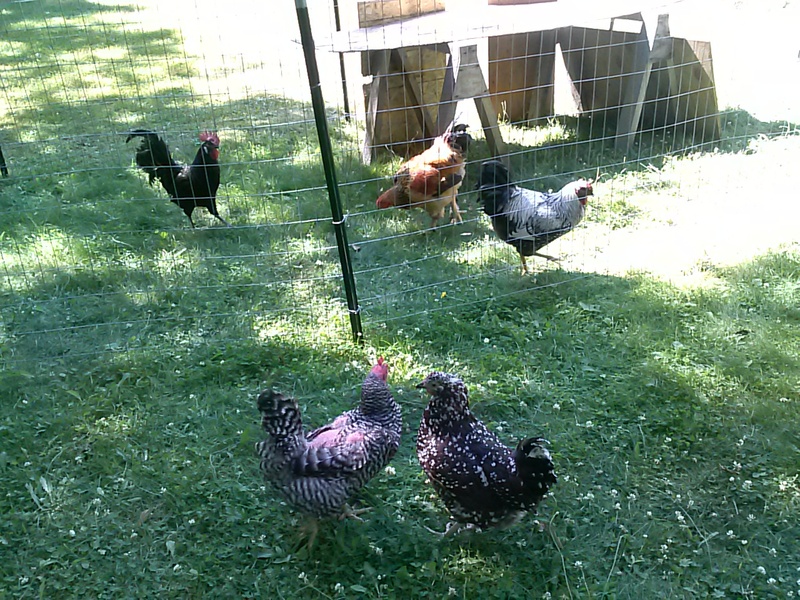 For the last few weeks, my five “teenage” roosters have been terrorizing my hens. They actually gang up on them – one mounts a hen and another runs up and bites her head while the first one mounts her – once it’s over she runs away and is chased by another one who was waiting for his turn. It’s gotten so ridiculous the last few days that some of my hens have been hiding in their nest boxes. Just hiding in there, all day long. Today, we fixed the problem. 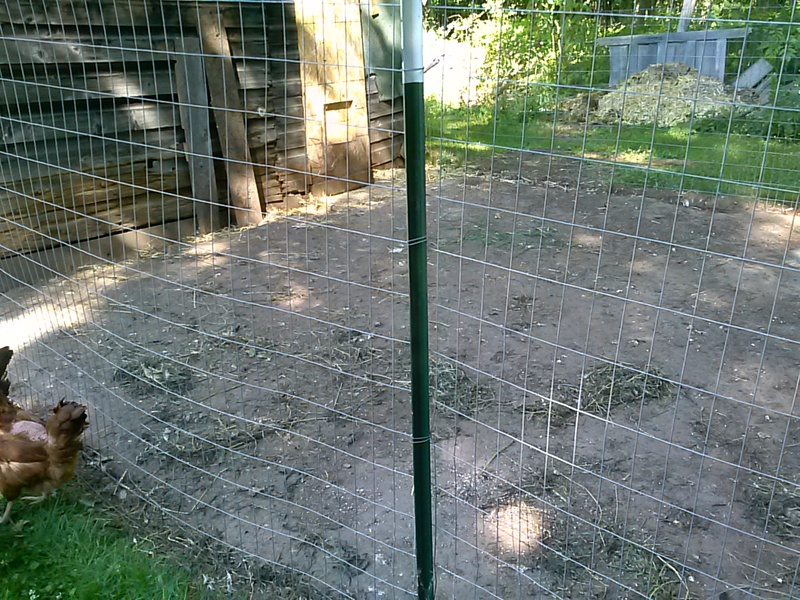 We added a new fenced run, but partitioned it so that the roosters are separated from the hens. We also are going to separate them inside the coop – The back part was the hens and teenagers (roosters and one hen), and the front was my chicks (3 months old now). Since we have to separate the roosters, they will have the back room of the coop, and the ladies and chicks will have the front part. 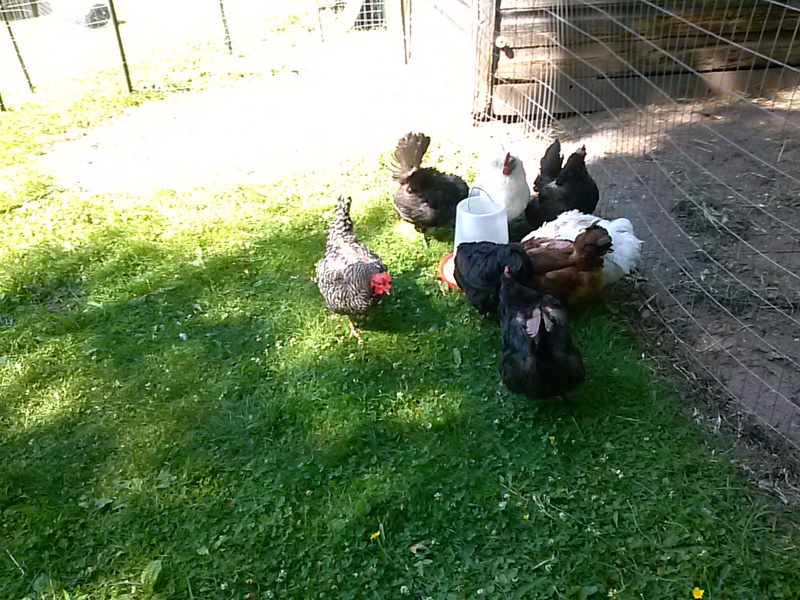 We are integrating the babies in with the hens – I figure everything is new for everyone, so it may cut back on the drama as they get to know each other. I have at least a couple roosters in the chick batch, so if I see any mounting they will get moved in with the roosters. 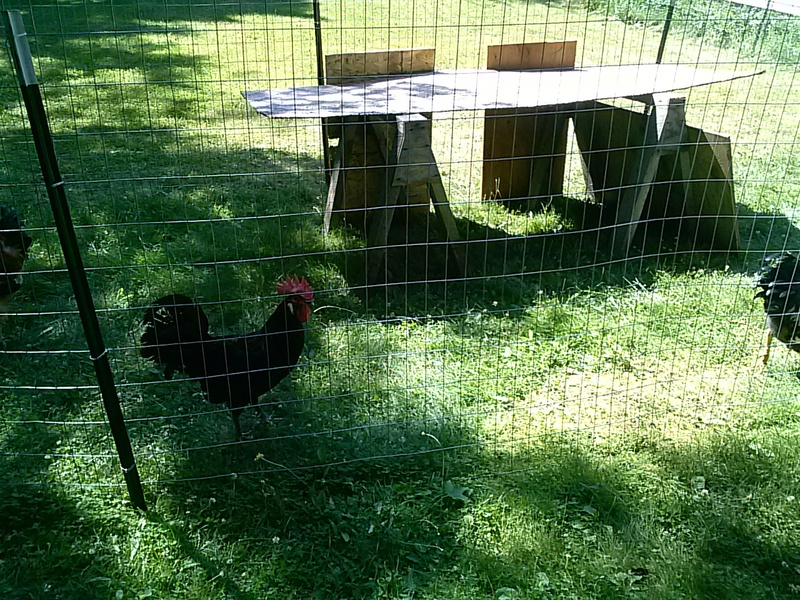 We made a fence “door” that closes off either the rooster or hen side for when we are moving them in and out – this means that the roosters will be stuck outside during the day, so we made them a makeshift shelter in case it rains or they want some cover. The hens / chicks can get in the coop if they want. The roosters are a bit upset that they can’t get to the hens. We used some sawhorses and boards to make the shelter for the roosters. The rooster’s shelter should protect them from rain for the most part, but it’s a little flimsy on top, which is good – I’m hoping that because it is, they won’t jump on top and try to fly over to the hens. We’ll have to see how this all works out. 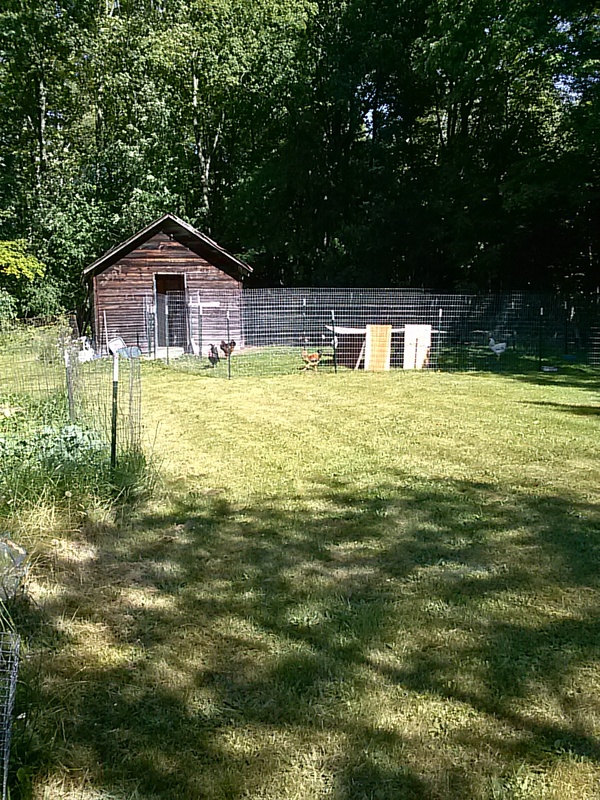 My next step is to plant some chicken forage into the old run – I have some organic chicken forage mix seed ready to go. Hopefully everyone likes their new run. 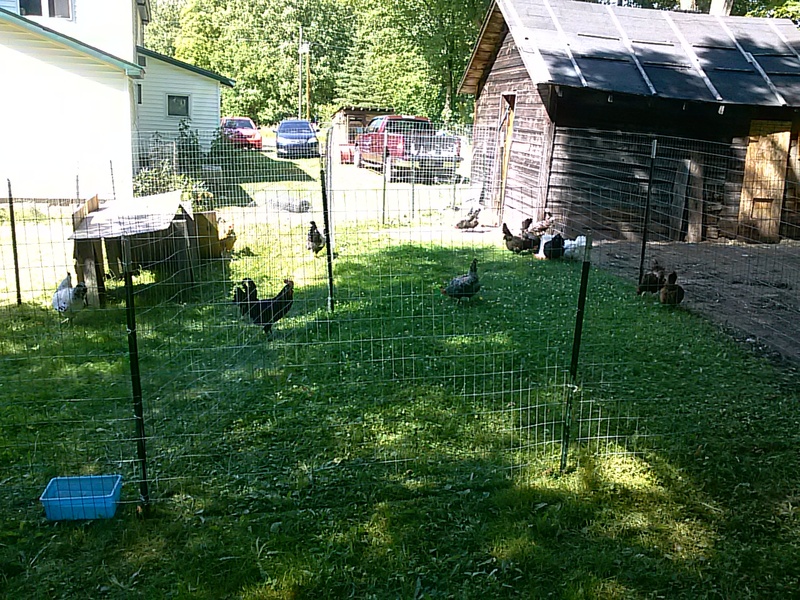 The roosters probably aren’t so happy, but they get nice grass to wander through/peck at. My hens seem a lot happier already. Good luck with the roosters. We just had to do away with ours. He had gotten so rough it wasn’t worth having him. Thank you. We are going to have to cull a few of them. I’m waiting to see for sure which of our babies are roosters before I choose who stays and who goes. We want to keep a couple for breeding in the spring, but I definitely don’t need this many. I’ll probably wait till fall to take some out.